NIRVANA-CTS is a private organization set-up in 2008 headquartered in Delhi with an ambitious plan of expanding to the other parts of the country.Our team consists of experts from all fields of the IT – Industry.The primary of NIRVANA-CTS is to provide top level Training personality development program to the future of IT world. To deliver what we offer, we have an ongoing process of keeping track of the changing needs of the industry and incorporate new technologies and ideas to improve quality training program at Nirvana.We believe that training is an essential part for the success in professional battle. It helps improve build the confidence to enter into the world of challenges in an extremely competitive environment. “NIRVANA-CTS will be known for excellence in IT Training and Placement with first choice for all students, society and industry where quality is the way of life." Our classroom is well devised for small size batch to limit the number of students to 10. This has been planned to have special attention to every trainees during the entire training programme. The classroom is well equipped for online/live practical and Wi-Fi technology to get access to Internet, and Videoconferencing for International Mentoring. We started this division with an objective to provide an easy path to the newcomers to enter into the IT-development field. With extensive research and market survey the training program has been designed, thusentirely different form the conventional coaching which is purely text oriented. We offer different packages that have been tailored according the current demand of the IT development world. The technologies selected for the training program are widely used in all type of development activities in IT-Companies. Therefore, having a good knowledge of these technologies will enable our candidates grow fast after getting a job. NIRVANA-CTS Training is providing special proposition during training course session to make it different and special from others. 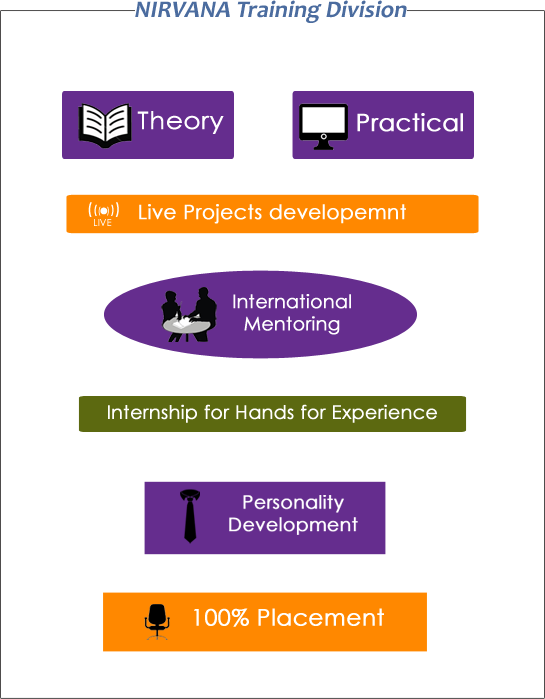 We provide: International Mentoring, Guaranteed Placement, Communication Skill Development, Personality & Confidence Development, and Internship on Live Projects Development. We are glad to offer our candidates the International Mentoring activity, which will enable them to understand international trend and market. The professionals working worldwide in different Multinational IT Companies having long experiences and expertise will directly address our trainees through Live Videoconferencing. This will also help them in personality development and confidence building. NIRVANA-CTS is committed to our trainees to place them in well known IT companies in India and Abroad with excellent carrier growth possibilities. This is 100% assured commitment of placement. The placement will be made soon after successful completion of the training. NIRVANA'S Training program has a Modern Approach to create a smarter workforce and yield the best result. Cognitive Method of training has more of theoretical training.